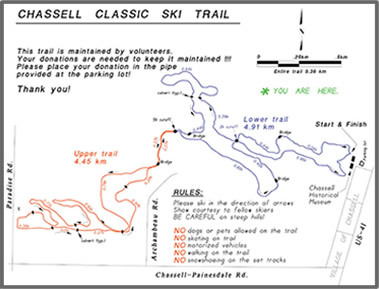 The Chassell Classic Ski Trail is 10 kilometers of single track trail, groomed for the classic skier. The trail goes over rolling hills, through sunny pastures, past picturesque ravines and under a canopy of protective forest. This trail has something for the entire family. There is plenty of space at the bottom of the hills and no sharp corners. There is also a 1.0 km lighted segement. This trail is maintained by volunteers. While there is not a fee to use the trail, donations are needed to keep it maintained. Please place your donation in the box provided at the Heritage Center. Lower Trail (4.9 km) - Easy to Intermediate. Sloping terrain through a varied stand of trees, interspersed with clearings.